This map displays the boundaries of the Zoning Regulations of 2016 with interactive search capability that allows users to look up zoning information for any property in the District. The DC Office of Zoning (DCOZ) is proud to present this interactive virtual map to help you visualize zoning data as well as curate potential development scenarios. The map offers 3D building and geospatial feature accuracy. An interactive summary of cases filed before the Zoning Commission and Board of Zoning Adjustment. Cases can be filtered by date filed, and relief sought. This interactive application displays versions of the Official Zoning Map dating from 1958 until the final version of the map prior to the Zoning Regulations of 2016 update. Scroll through to get an orientation to the Zoning Regulations of 2016 zone types, boundaries, and related zoning categories. The summary zoning maps are static PDF images of the interactive Zoning Map. They are produced on a quarterly basis. 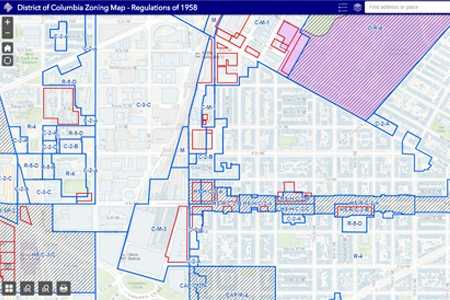 Use this simple, interactive map to explore how the zone boundaries and names converted from the 1958 Zoning Regulations to the Zoning Regulations of 2016. This interactive web-based Zoning Map showcases the zone designations of the Zoning Regulations of 1958 and is provided for historical reference only. As of September 6, 2016, these zones are no longer in effect. Click here to find and download zoning data from the DC Open Data site. 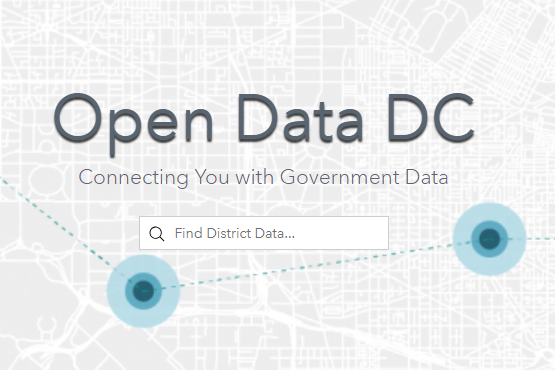 The District invites you to browse the data, download it as a file, analyze it with your tools, or build apps using our APIs.